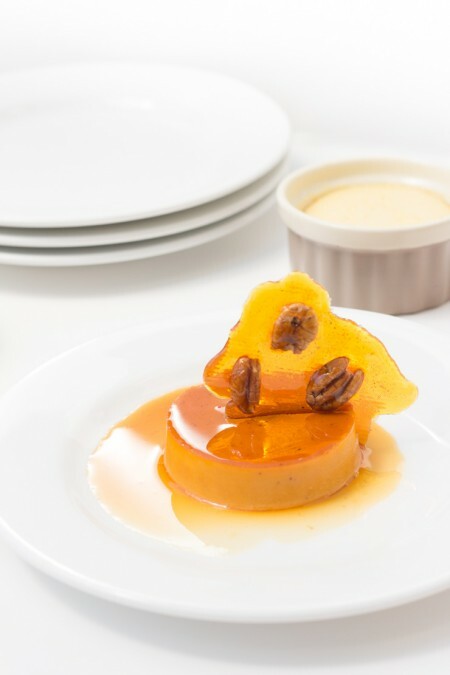 Drunken Pecan Crème Caramel— Artisan pecan liqueur, vanilla-bean cream base with a thin layer of darkened homemade caramel hosting a crunchy pecan brittle crown. 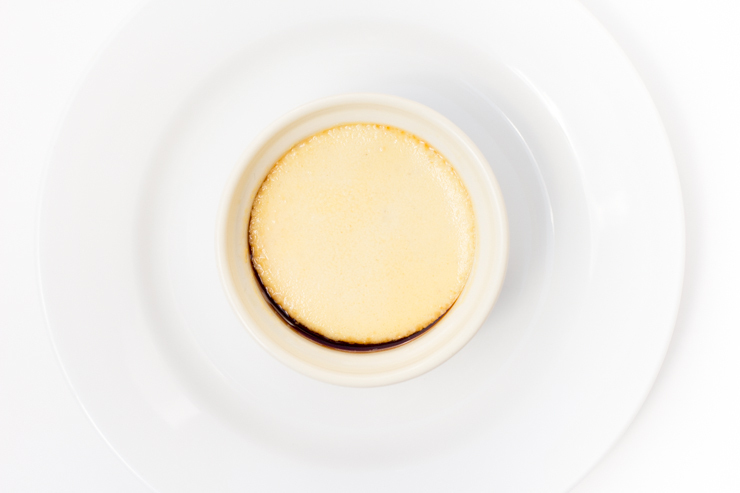 I’ve always been sorta mesmerized by the obsession which many people have with the cream-based desserts, like crème brûlée. I guess the delicious simplicity that they radiate just draws people in. Cream and sugar has always been a winner, right? Sure. I love you, friends. But no, I didn’t put much effort into this. I decided to spend my free time taking cat photos instead of planning something more elaborate. Acceptable, right? I think so. 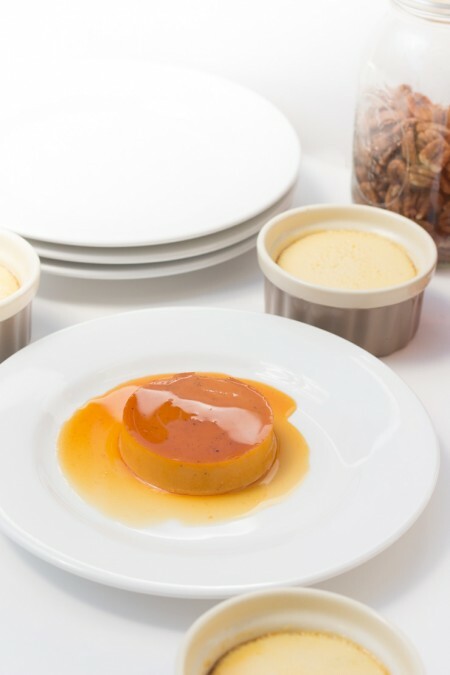 The simplicity of a crème caramel might surprise you. Now, y’all know I am usually a stickler for the specifics when it comes to baking. I would normally tell you to get out that thermometer, scale, etc. Not this time. 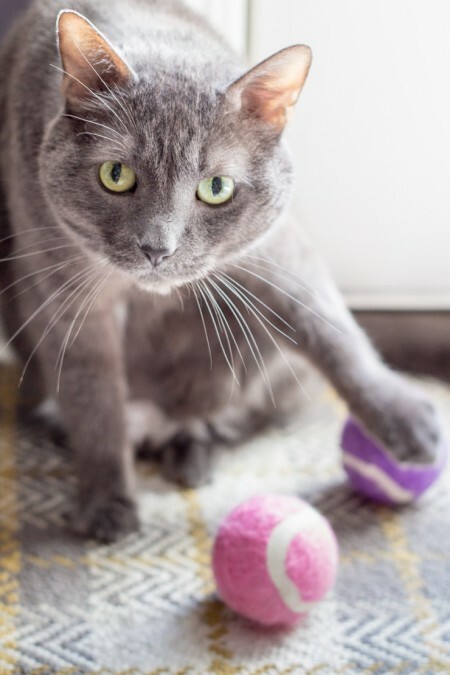 We have more cat pictures to take, remember? Some sugar, water and a touch of lemon juice (to deter from the dreaded crystallization). Done. Since we have a bit of caramel left (because obviously we are going to make more than we need so that we have an excuse to eat it), we’ll make some tasty little decorations. Everyone loves a crunchy sugar brittle. In my book, why have a decoration if you can’t eat it? A simple dark caramel brittle with some fresh Georgia pecans. I had a bag of Pearson Farms pecan halves that I had miraculously not eaten yet, so I used those. Some of the best I’ve ever had. With my family being from Georgia, I just couldn’t leave them out. The important part of making a consistently creamy custard is in the baking. You really need a buffer zone. Baking these with water around the ramekins will help them bake evenly and not too quickly. Since these are going to become drunken pecan crème caramels, we should probably address the drunkenness. Tossing pieces or whole pecans in the cream might be just dandy and all, but a little brandy for all sounded better. Candy is dandy…. but a boozy baker is better. 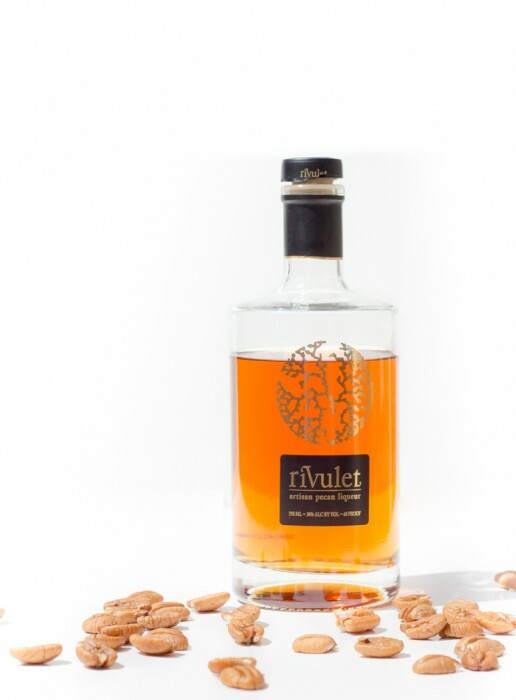 I was recently given the chance to preview Rivulet Artisan Pecan Liqueur. This. Stuff. Y’all. I just don’t even have the words to describe how incredible it is. This is some of the most smooth, perfectly balanced, flavored liqueur that I have ever had. 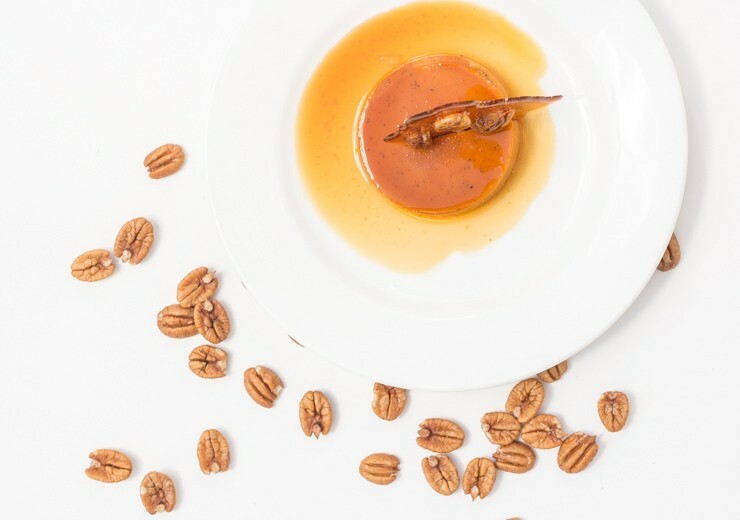 Brandy-based (the smooth, caramel liqueur — not Moesha herself), this pecan essence infused 60-proof bottle of perfection has to be the absolute best way to get a perfect pecan flavor into anything that you are baking… or just into your mouth, for that matter. This is currently #1 on my new liqueur discoveries for this year. Once these babies come out of the oven, you just let them cool to room temp and toss them in the fridge. I usually do this the day before I plan on serving, although you could just serve them an hour or so after baking. They are best chilled in my opinion. It’s pretty amazing to me that the caramel base just sorta slides right out after these are baked. You would think that it would just harden and end up being an all-day cleaning project instead of an insanely tasty dessert project. It’s black magic, I tell ya. Delicious, creamy black magic. Getting this thing on a plate is the fun (?) part. It’s ride or die at this point. Finish that glass of wine and hope for the best. Place your plate inverted on top of the ramekin, hold your breath, take a xanax… caaaaalm down, flip! You should immediately see the caramel running on the plate. Slowly remove the ramekin and stare at your masterpiece. You’ve done it. Start drafting your small café and bakery plans. You are basically a chef now. If you haven’t eaten every single one of the pecan brittles, go ahead and throw one of those on each plate too. 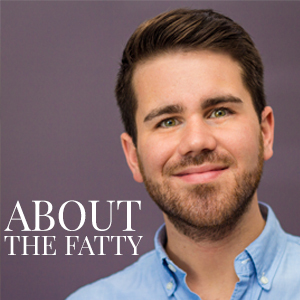 If you maybe, possibly, sorta ate them all– well, just throw a pecan on there or something. It’ll be our little secret. 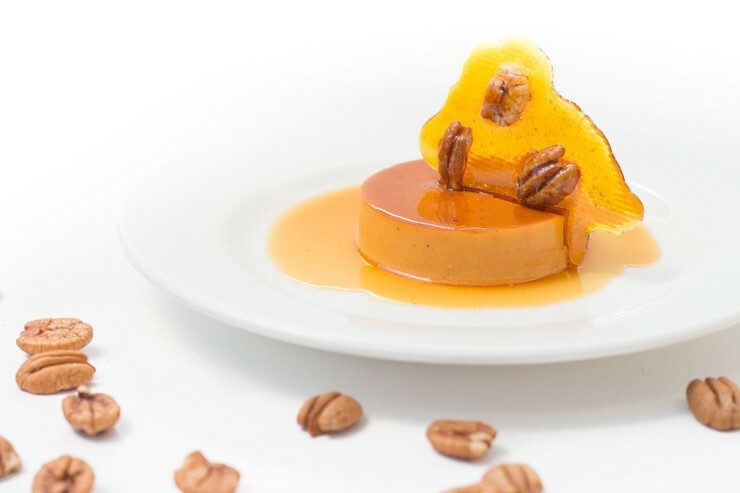 Darkened caramel sauce blanketing the light, creamy vanilla bean and pecan-infused custard cream, all topped with a sweetened pecan brittle. It just doesn’t get any better than this. Luckily, it doesn’t get any easier, either. 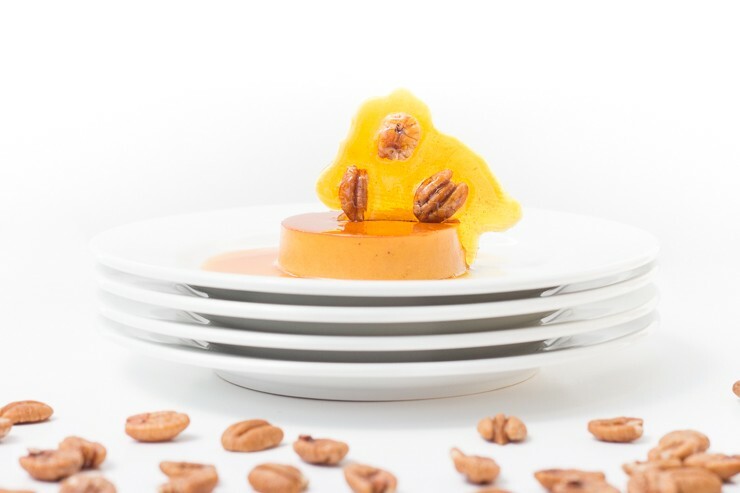 Pecan Crème Caramels -- Darkened caramel sauce with light, creamy vanilla bean and pecan liqueur custard cream, all topped with a sweetened pecan brittle. From SouthernFATTY.com. Place ramekins out (4-6) and very lightly grease with cooking spray. In a very clean pan, combine sugar, water, lemon juice. Stir until mixed. Leave on medium heat (do not stir at all after the initial stir to blend) until it starts to brown around edges of saucepan. this may take some time. While waiting, use the pastry brush and water to carefully brush around pan sides to prevent sugar crystals from forming. When browning starts around edges, gently swirl pan around to evenly distribute darker caramel. The caramel will start to darken very quickly. When a dark amber, remove and immediately pour into each ramekin. 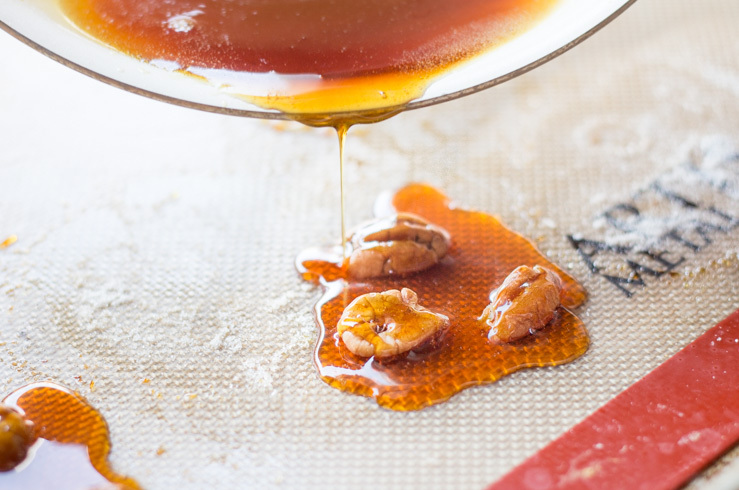 Place some pecans on a silicone baking mat and pour the leftover caramel over to form small decorative brittle. Let cool. 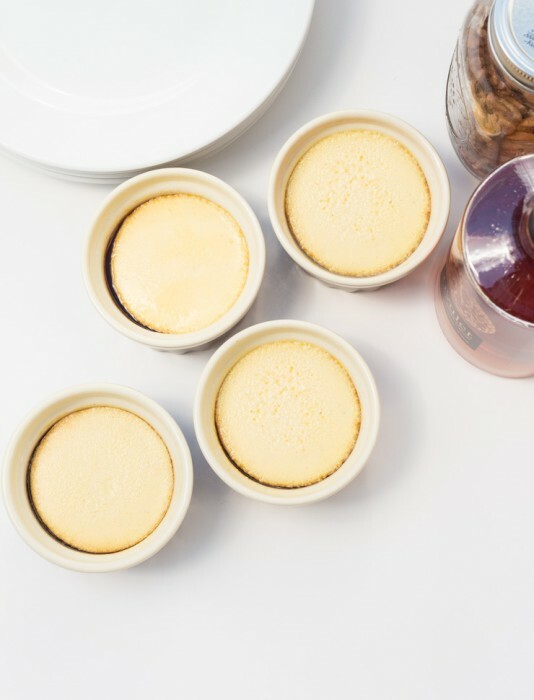 Set ramekins to the side to cool and rest. In a prep bowl, combine yolks and sugar. Whisk until pale and fluffy. Add vanilla, salt and whisk well. In a saucepan, heat cream over medium heat until bubbles start to appear. Do NOT boil. Once bubbles appear, remove from heat and add pecan liqueur (or extract). Add a small amount of hot cream into the egg mixture while constantly whisking. Continue to add cream in portions while whisking until all is combined. Portion cream into ramekins, on top of caramel. Place ramekins into a deep baking dish (roasting pans work well). 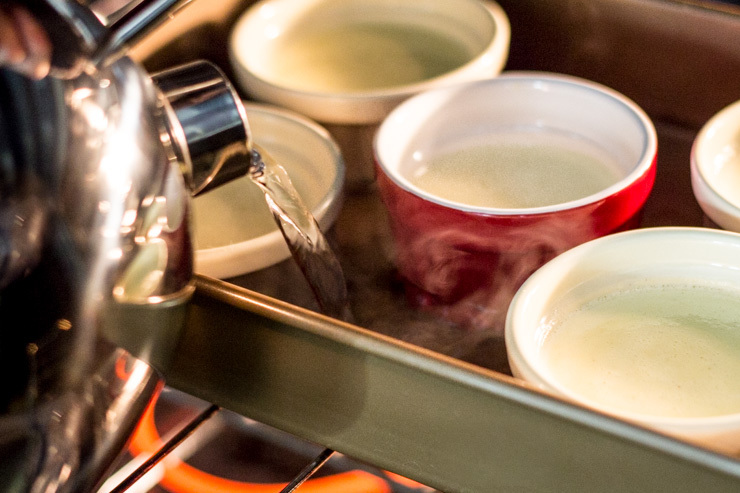 Heat a kettle or pan of water until steaming. Place dish with ramekins on oven rack and pull out slightly to easily access. Pour water into dish until about halfway up ramekins. Carefully push rack back into oven. Bake until the cream doesn't giggle, about 20-30 minutes. Turn off oven and leave inside closed oven for 15 minutes. Remove from pan and let ramekins reach room temperature (about an hour). For best results, cover with wrap and chill over night. 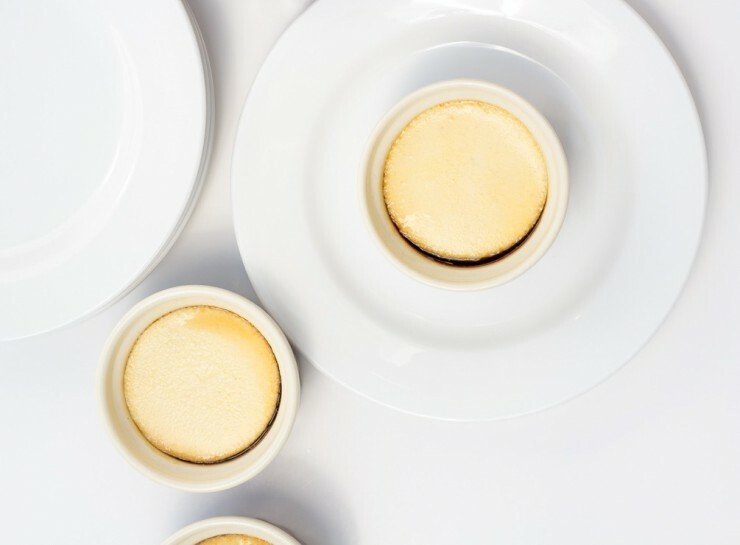 When ready to serve, place inverted plate on ramekins, flip and lift. Top with pecan brittle and enjoy! Awesome! I haven’t made these in a while, but they were soooo good. Love the bit of pecan it has. Glad you enjoyed it! fancy pants! these look super tasty. and you’re right — cream and sugar, never go wrong. Look fancy, but soooo quick and easy! Easy, Ramona! But… I mean, the caramel! oh my gosh that photo with the brittle looks stunning! 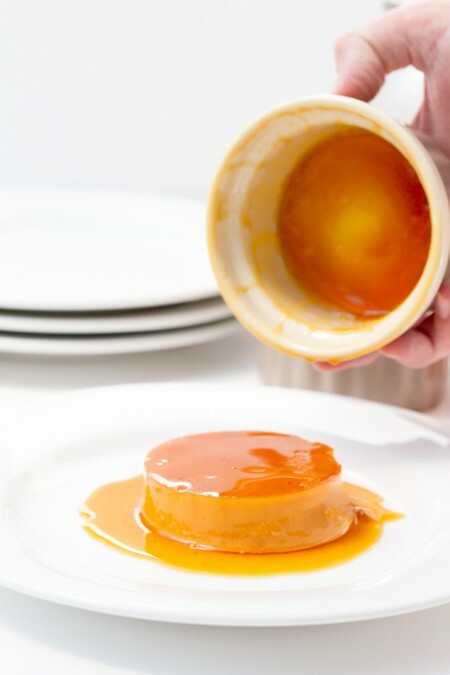 I’m not a huge creme caramel fan personally but every one of my family members and the hubby loves it so I’ll be making this. Philliiiiiip. You’re killin’ me here. I love creme caramel, creme brûlée, etc. And I LOVE the pecan brittle garnish. Perfect. Thanks for the recipe! Such a pretty dessert! Anything with “drunken” in the title has to be fabulous! It ended up being pretty simple! Yeah, I don’t know what it is, but all those custards like creme brulee and pots de creme are like my favorite desserts. This looks like something I would inhale immediately. Also, it looks so freaking profesh, I don’t even know. Aw, shucks! Pardon me while I mail one to you….